In 2014, my friend, Kevin Lindsey, asked if I would get coffee with one of his clients, Mike Haverty. Because Kevin is an advisor at a merger and acquisition firm I was a bit unsure – I wasn’t looking to sell my company. But Kevin assured me that there weren’t any expectations for the meeting. He thought getting coffee was a good idea simply because Mike and I were like-minded. So, I met Mike for coffee. Then, we had another meeting at The DVS Group office. Over the course of several months the conversations went from basic networking to a more serious consideration of Mike’s fit with what my company was doing. By early 2015, Mike had invested in Barrier and taken one-third of the company’s ownership. And, although we weren’t originally looking for an additional partner, the transaction has been great for Barrier. Mike’s contributions have been essential for our growth and success. 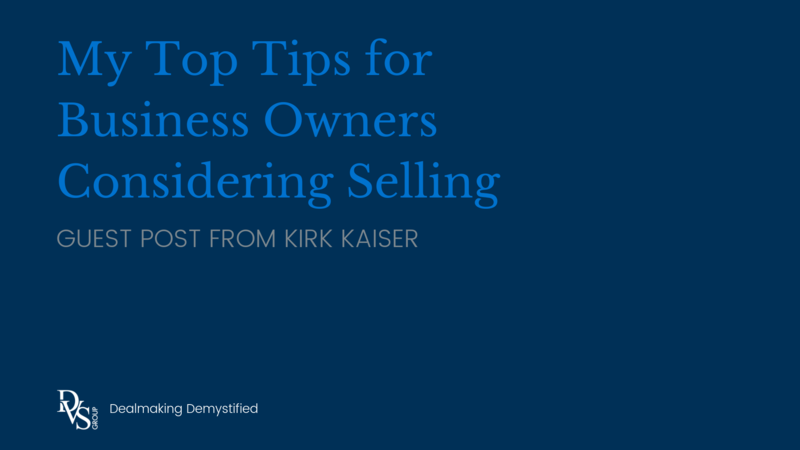 Using my experience as a business owner for two different companies, where I sold either all or part of the business, here’s my list of top tips for business owners considering selling their business. I never would’ve gotten connected with Mike or received the incredible value he’s given to our company if I hadn’t been engaged with my network. Kevin was aware of my business and some of our needs so he knew Mike could be a solid addition. Jaye and I weren’t looking for a third partner but I wasn’t really surprised that’s how it ended up. So much happens organically in the business world. Don’t be afraid to have conversations because you never know where they might lead you. A valuable characteristic of your network is the innate accountability it produces. I can be relatively confident that a person isn’t going to cheat me if I know many of the same people they do. That person has an added incentive to do their work well. The further away you get from that personal investment in the individual, the more likely the relationship will just be transactional. In general, in the same way a real estate agent is, when you go to most M&A firms, they’re just dealmakers. When vetting potential M&A firms, be sure to separate out the crap from what is really going to take place. Finding someone who truly has a vested interest in you is important. And, just like I mentioned above, because of the innate accountability it produces, the best way to guarantee that vested interest is to use your network. In Mike’s buy-in transaction, The DVS Group was representing Mike, not me. But, Kevin made sure both parties were moving forward smoothly. There are a whole lot of promises made on the front end in this space that usually don’t end up happening. The thing I appreciated about The DVS Group was that, because Kevin and Ben are detail-oriented and honest, I knew that if they told me something, they were going to do it. I have found it is helpful to correctly frame my perspective on the business I own. I view it like I view my house. When you have a house, you decorate it the way you want to decorate it, you landscape the yard, you put an addition on the back, you fix it up. The house takes on your personality and reflects you. But, you will sell that house and the new owners will inevitably make it their own. How many people go back to their old house and stay a few nights each month? Not many. The same is true with your business – love it while you are there but some day you will pass it on and you likely won’t go back very often. And, don’t forget – just like you need to know where you’ll be living after you sell your house, you need to explore what’s next after the sale of your business. This will take some time. If you don’t do that upfront work, when the time comes to sell, you won’t be willing to cross the finish line and get the deal done.